Specialists of the branch for construction of facilities of JSC CONCERN TITAN-2 work at the construction site using their own resources. Currently, the vertical layout of the territory has been prepared, piles are being driven and the external networks installation is being performed. Construction workers are preparing to begin the installation of foundation grills. 163 piles out of 648 were driven by the specialists in March. On average, 30 piles are driven per day. It is planned to increase the productivity to 40 piles per day in the nearest future. 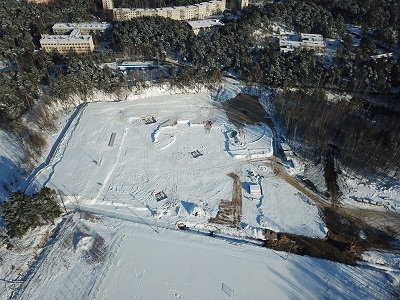 Piles for the volleyball centre foundation are manufactured at the UPP production site of special concrete with certain frost and water resistance parameters.